From April to November, though more commonly in spring and autumn, the Coprinus appear, and it is not an uncommon occurrence when a single stump will yield several crops in a season. Sometimes the group of mushrooms seems to grow directly from the earth and are apparently far from decaying wood. However, there is probably a piece of wood hidden beneath the surface of the ground, upon which this dependent plant is being nourished. The clusters of the Glistening Coprinus are frequently very large, and contain a number of individual plants. Thus, though the plant itself is small, the whole cluster will furnish quite a harvest. In Europe this mushroom is not included among the edible forms. Dr. Peck suggests that this may be due to its small size, but the abundance and ease with which it may be procured compensate for its lack of size. By those who have eaten it repeatedly without harm it is considered a delicacy, and not inferior to many other species. When raw it has a flavor of nuts. 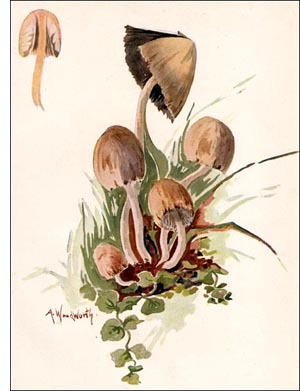 The genus Coprinus, to which the mushroom of our illustration belongs, includes a number of specie,� which are commonly called Ink Caps. All are easily identified, for soon after the spores have matured the plates that bear them are resolved into an inky fluid, especially in damp or wet weather, Their life histories are nearly completed while still beneath the surface of the ground. It is only when their spores are quite mature that they seek the air above the surface, pushing themselves out in the night time, only to melt away in inky drops during the day. Sometimes when the weather is not damp all the parts may dry and the mushroom remain well preserved. It is only when young that the glistening coprinus should be gathered for food, and the specimens should be cooked immediately, for they are far from attractive when they have turned black.